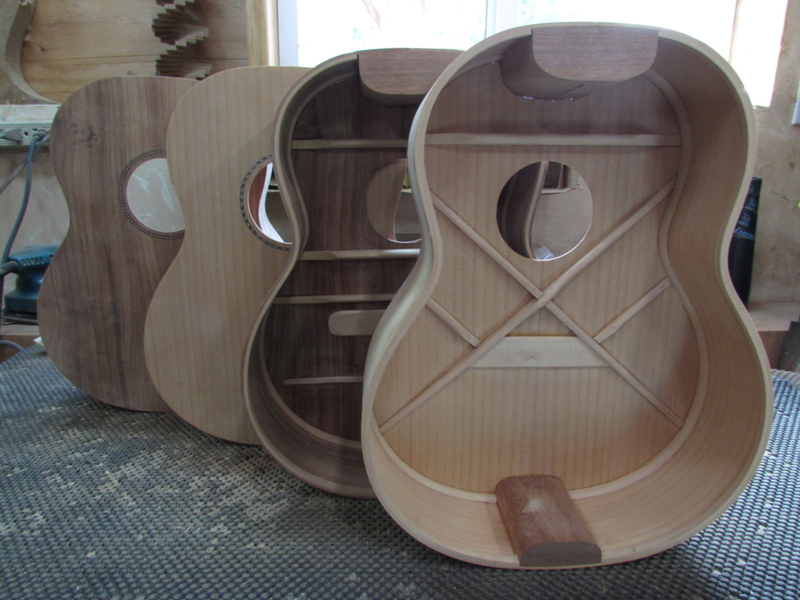 After working on the basses & dreadnought, these four tenor ukes are coming together quickly. Lots of northern California tonewood for this batch: two Monterey cypress from Point Arena (a neighboring town on the southern Mendocino coast), and two acacia from San Francisco’s Presidio. There are both X-braced & ladder-braced tops for each wood variety, so we’re eager to hear the difference. Other features: ebony fingerboard, 16-7/8″ string length, Sitka spruce bracing, hot hide glue construction, abalone or mother-of-pearl Dart logo/fingerboard markers/side dots. If you’re interested in reserving one of these beauties, contact David.